Hanoi (VNA) – The Central Military Commission (CMC) on March 19 held a teleconference to review 10 years of implementing the 10th-tenure Politburo’s Resolution No. 28/NQ-TW on continue turning centrally-run cities and provinces into firm defence zones in the new period. 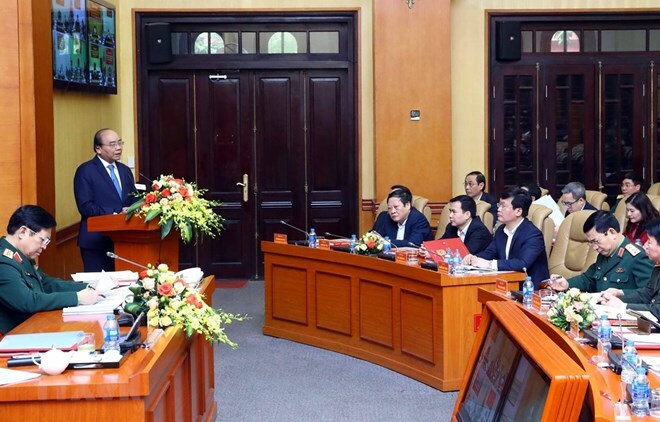 Prime Minister Nguyen Xuan Phuc, head of the Central Steering Committee for Defence Zones attended the event, which was chaired by General Ngo Xuan Lich, member of the Politburo and Deputy Secretary of the CMC and Minister of National Defence. Sen. Lieut. Gen. Phan Van Giang, Chief of the General Staff of the Vietnam People’s Army and Deputy Minister of National Defence, said that over the past 10 years, the Resolution No. 28 has been realised comprehensively with many documents issued to direct the building of defence zones. The steering committees for defence zones at different levels have been established and reinforced with increasing efficiency, he said. Along with the building of pilot models, arising problems during the operation of defence zones have been settled timely, while communications have been increased to raise public awareness of defence zones and national defence. The mechanisms to direct the construction and operation of defence zones have been completed, with focus on building strengths in politics, socio-economy, science-technology, and defence-security, said Giang. Participants at 106 teleconferencing points nationwide disucessed solutions to continue making centrally-run cities and provinces into steady defence zones in the coming time. Addressing the event, Prime Minister Nguyen Xuan Phuc recognized efforts of the CMC, the Ministry of National Defence as well as ministries, sectors and localities in implementing the Resolution No. 28. He noted that the operation mechanisms of defence zones have proved to be effective, while the public awareness has been improved, the combat readiness of the armed forcea has been enhanced, and national independence, sovereignty and integrity have been ensured, maintaining a peaceful and stable environment for national development. The PM said that the building of firm defence zones is an active national safeguarding strategy by mobilising the power of the whole nation since the peaceful period. He stressed the need to continue completing the Party’s policies as well as the State’s management over the building of defence zones and suggested a number of measures to enhance the efficiency of the implementation of the resolution in the future.